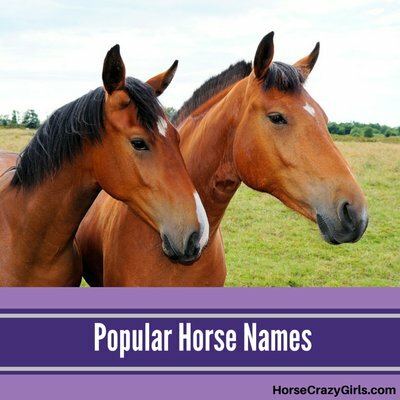 Here you'll find popular horse names shared by other horsecrazygirls like you! Feel free to comment on any of these names or share your favorite popular horse names here. Find more fun horse and pony names here! Here are favorite popular horse names shared by horsecrazy girls. Click on any name to comment - or to add your favorites! Share your favorite popular horse names here! Use the comments link to share your ideas for popular horse names. We'd love to hear them! I would like to give a big thank you to thecougar for helping me name my mustang orphan colt. I like that name and it was a horse name in one of the books by Lauren Brooke. Phoenix is my favorite horse name. It was the name of my first horse who already died. Because I want a horse named that. Because I love the saddle club and one of the horses is called Comanchie!!!!!!!!!!!!!!! I need a horse name.. Note from Sydney: For ideas, you can check out the other submissions for horse names. Good luck! I choose Sparrow as my fave horse name. The idea is from Captain Jack Sparrow off of Pirates of the Caribbean. It's the horse name of my FAVORITE series!! It's the name of a dragon in the movie Eragon and it's my name. It was the name of my first horse and I luv him so much! Cause I think that it could be a name for a white and black horses. My fave horse name is Junior, cuz it's the name of my horse! I love Denny because it is the buckskin horses name from the movie "The Man From Snowy River". It's cute if you like star wars!! Because twilight is the best film ever and it suits my horse because hes piebald.